Last month, we presented a retirement planning case study on our hypothetical couple - John and Lisa – with $1 million of savings at retirement. We will consider an alternate scenario where John and Lisa did not have the means to save $1 million. This time for John & Lisa, we will scale back their retirement savings goal to $500,000 at age 62, when they plan to retire. We will analyze how they could still make it to a comfortable retirement while still growing their capital in retirement. In the previous article that we wrote on our hypothetical couple - John and Lisa - we tried to demonstrate how they could retire in 10 years, starting with a modest savings of $300,000 at the age of 50 years that would grow to $1 Million by the time they actually retire at 60. We had assumed their annual income to be $140,000 and that they would save 16% of their annual income for the next 10 years to reach their goals. Not surprisingly, some readers complained that $1 million was too high a target and not everyone would have the means to save such a large sum. On the flip side, some others argued that even $1 million does not go far enough these days to afford a comfortable retirement. Though this subject is highly debatable and obviously the savings target and spending expenses will vary from person to person based on personal situations. There are always two sides of a coin, and there is some element of truth on either side of the argument. Obviously, it goes without saying that we should always aim higher and save as much as possible. That said, everyone's situation is different. 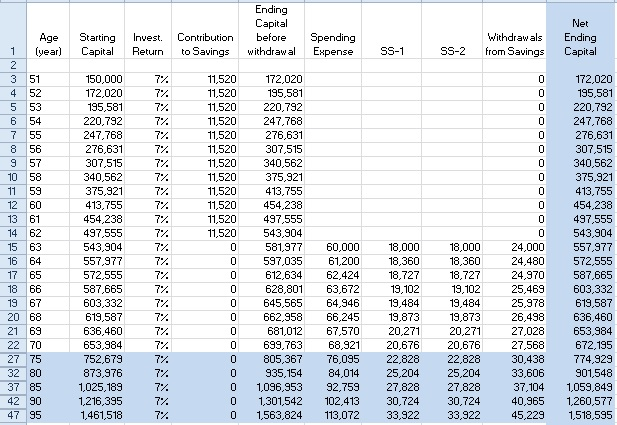 We thought it would be worthwhile to work out an alternate retirement planning scenario, where the couple’s current income and spending habits/expenses are much more modest, hence their retirement goal would be much lower at $500,000. We will assume their current annual income at $90,000. Please note that this couple's spending needs would be lower as well. In the previous scenario, we had determined it to be $75,000 a year (adjusted for inflation). However, in this example, our hypothetical couple - John and Lisa - would need only about inflation-adjusted $60,000 a year (or $47,500 in today’s dollars). This is in line with the average spending of retired folks in the US. According to a recent article based on the data from the Bureau of Labor Statistics, “older households” spend an average of only $45,756 a year, or roughly $3,800 a month. Older-households are defined as those run by someone 65 and older. This is about $1,000 less than the monthly average spent by all of the U.S. households combined. Also, please note that this is just an average, which means there are a lot of households that spend even less than $3,800 a month. 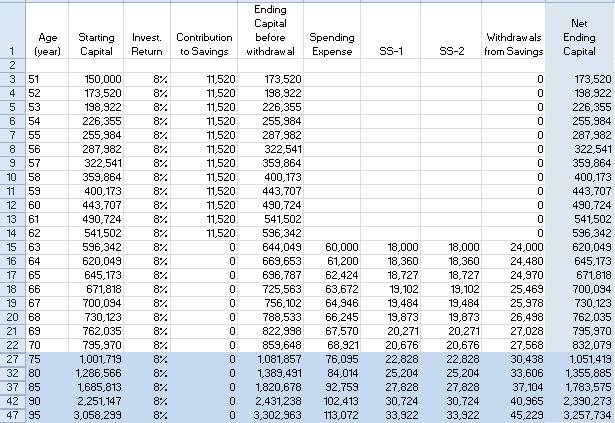 So, we will assume that John & Lisa would have a goal of saving $500,000 by the time they are 62 years of age (instead of $1 million at age 60). We will also assume that their savings-capital at 50 years of age is much more moderate at $150,000 (instead of $300,000 in the previous article). Couple’s current household gross income is $140,000 a year. Couple’s current household gross income is $90,000 a year. They start with a savings-capital of $300,000 at age 50. They start with a savings-capital of $150,000 at age 50. They plan to retire in 10 years at 60 years of age. They plan to retire in 12 years at 62 years of age when they are eligible to withdraw social security. By saving aggressively and with some reasonable growth projections, their capital would grow to $1 million by the time they are 60 years old. With moderate savings and with reasonable growth projections, their capital would grow to $500,000 plus by the time they are 62 years old. They planned to pay off their house mortgage by the time they retire. They would not carry any debt into retirement. They will not be able to pay off their house mortgage entirely by the time they retire. However, they would downsize a year before retirement. Their post-retirement expenses were $75,000 after taking into account the inflation. Please see the previous article on how they determined this amount. Their post-retirement expenses would be $60,000 after taking into account the inflation. We also assumed last time that John would start withdrawing the social security payments at the earliest eligibility age of 62, whereas Lisa would wait until 70 to have a higher SS payout. Both John and Lisa would start withdrawing their social security at age 62 (the earliest eligibility date). Obviously, they will have the option to work part-time and delay the SS withdrawals by a few years. At the age of 50 years, John and Lisa had $150,000 in their 401K/IRAs. They decided to raise their 401K contribution rate to 8% of their income. They would also get an 80% match of the first 6% contribution from their employers. On their combined salary of $90,000, this would amount to $11,520 contribution/ addition each year. They decide to retire at age 62 (instead of 60 years) when they would actually be eligible for Social Security payments. They are planning for 62, but they may continue to work beyond 62 or work part-time, depending upon how they like at the time. By working part-time until 65, they could delay the SS withdrawals and also reduce their spending on healthcare. Assuming, a very conservative return of 7%, and by regular 401K contributions, their retirement savings would grow to $500,000 plus by the time they retire at 62 years of age. Inflation and the average SS COLA adjustments are assumed to be at an average of 2%. The spending needs will be adjusted upwards every year for inflation and COLA adjustment. House mortgage: After carefully looking at their financial situation, John and Lisa decide that they were not in a position to put any extra money towards house mortgage principal. As a result, they would not be able to entirely pay-off the house prior to retirement at 62. Instead, they would downsize and move to smaller accommodation in retirement. Since they would not need to commute to work in retirement, they could move to an outer suburb where they could get a comparable but little smaller housing for about the same amount as their equity in the present house. As a result of this transaction, they would also pay less in property taxes and insurance on the new house. John and Lisa determined that their starting expenses in retirement would be $60,000 in inflation-adjusted terms or $47,500 in today’s dollars. In the previous article with $1 million savings, we had assumed this to be $75,000. John and Lisa make their retirement planning based on the assumption that they would be able to get an average yearly return of at least 7% on their investments. Though 7% annual return is very reasonable, it is a very critical assumption that can make or break John and Lisa’s retirement planning. We will discuss strategies that can help achieve very modest targets of 7% to 8% return. Below, we will present the investment results with two different rates of return, 7%, and 8%. Note: To keep the image readable, after the 70th year, we have only presented net balances at the end of every five years. The above examples show that John and Lisa’s investments grow in both cases. Of course, they grow much faster if the rate of return on their investment was 8%. A return of 9% or more will actually do wonders for their retirement balances. But even with 7% return, they will be able to manage a comfortable retirement with their principal growing albeit slowly. We have included the calculations until the age of 95 years. Though the stock market has returned more than 9% on a long-term basis, however, there is no certainty of constant returns. It can go up sometimes and can also go down a lot during recessions or major corrections. If a recession was to hit early in the retirement phase, it could be devastating on the retiree’s finances. So, all of this planning and calculations require that the retiree invests wisely and able to get an average return of 7% or higher. We can see from the above examples, the importance of the rate of investment returns that John/Lisa is going to get. This is critical in determining if they are going to have a very comfortable retirement or are they going to have to worry about money and cut corners. However, fortunately, we are not aiming for some dramatically high rates of returns. We are only talking about 7-8% returns on an average basis. The stock market has provided on an average of 9% returns over long periods of time. But two things need to be kept in mind. First, this average is “over long periods of time,” and not necessarily the similar return year after year. Secondly, this is just an average, and it means that so many retail investors get much lower and sub-par returns due to several reasons, including keeping too much in cash, buying at peak and selling in panic situations. Below we will demonstrate how to avoid many of the above pitfalls and aim for at least 7-8% overall returns on a consistent basis. There are several ways to meet this goal. We have presented many strategies in our past articles. We prefer to adopt more than one strategy to provide strategic diversification. Below we present one such model. We present (see below) a sample DGI portfolio consisting of 20 names, a majority of which are relatively conservative names, provide a decent dividend and trading at a relatively cheap valuation. If you are putting new capital into the portfolio, we recommend buying in 4 or 5 separate lots spread over a year at least. This will avoid a situation where the market has a major correction just after you buy. This strategy aims for about 9% or higher returns on a relatively consistent basis, with minimal drawdowns. The strategy uses only two securities, S&P500 Index fund ( SPY) and 20-year Treasury Fund ( TLT). The strategy invests and rotates between the two securities based on volatility measurements. The basic premise is that the lower the volatility in S&P500, more of the investment dollars should be committed to Stocks or S&P500 in this case. As the volatility in stocks or S&P500 increases, the strategy gradually moves money to the Treasury fund, as a safety asset. Some would critique that Treasuries have been on a bull run over the last couple of decades and it may not work the same way in the future. However, it is our belief, that during a crisis and panic situations and/or sudden downturns, Treasuries will always perform reasonably well, since investors find safety in them. If someone does not like long-term Treasuries at this time, it could be replaced with 7-10 year mid-term Treasury Fund ( IEF). However, the overall results may vary or suffer a little bit. 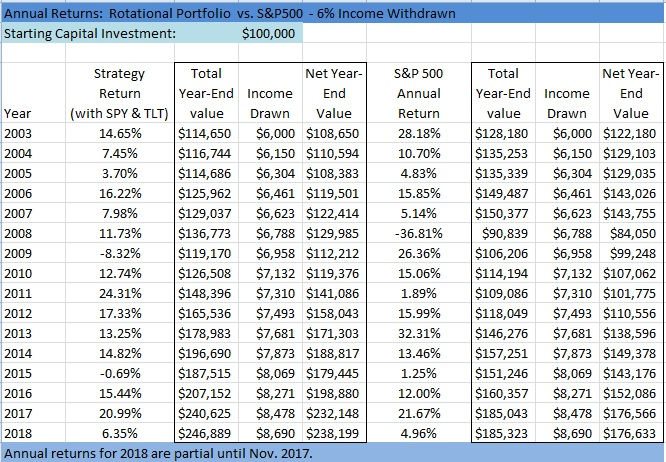 Below we present the results from using this monthly rotation strategy since the year 2003, using the above two securities, S&P500 and TLT ( using the annualized volatility target of 8% over the previous month). The worst year for the strategy was -8.32% compared to -37% for S&P500. The maximum drawdown was -15.5% compared to -50% for S&P500. 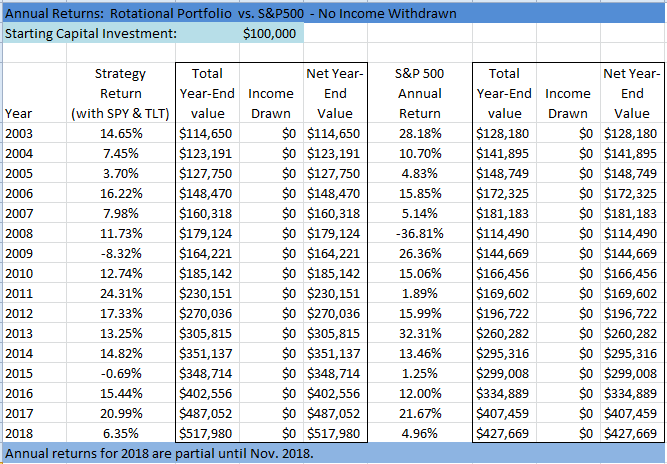 The annualized return for the strategy was 10.95% compared to 9.60% for S&P500. As one can see, the strategy performs better than S&P500 and at the same time without the bumps. When the income is withdrawn (on a yearly basis), the strategy performs even better and ends with much higher balances compared to S&P500. 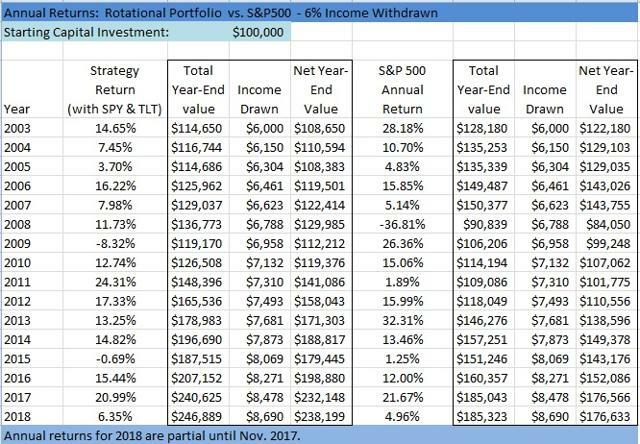 In the case of S&P500, the retiree is forced to withdraw the income at times when the market is doing poorly, which results in overall inferior results. We tried to demonstrate that even with half the starting capital (compared to $1 million in the previous article); John and Lisa would be able to have a reasonably comfortable but modest retirement. Obviously, this modified strategy requires some sacrifices and compromises. We also demonstrated how small decisions could change the outcomes for anyone. So, planning is important and almost always dependent on personal factors and situations. There is, of course, no substitute for saving more and starting as early as possible. It is always better to aim for more rather than less. If one had a long time horizon, an investment in broad market indexes can also provide good results, but the investor needs to be prepared for a bumpy ride and big drawdowns. This is where the risk comes since most people are not prepared for big drawdowns. The above example shows that a Rotation strategy can smoothen the ride, which will also result in higher returns, especially during the withdrawal stage. We could see in the above examples how critical is the rate of return on our investments. It is important to invest wisely and grow the savings on a consistent basis. A return of less than 6% might result in a gradual depletion of John/Lisa’s savings into their 80’s or 90's unless they were able to reduce their spending. Two things stand out – first, we need to get a minimum of 7% return and secondly with minimum possible volatility and drawdowns. Fortunately, 7% or 8% is not a very ambitious growth target and highly feasible for most folks with some knowledge and by avoiding the common pitfalls. Full Disclaimer: The information presented in this article is for informational purposes only and in no way should be construed as financial advice or recommendation to buy or sell any stock. The author is not a financial advisor. Please always do further research and do your own due diligence before making any investments. Every effort has been made to present the data/information accurately; however, the author does not claim 100% accuracy. The stock portfolios presented here are model portfolios for demonstration purposes. High Income DIY Portfolios: The primary goal of our "High Income DIY Portfolios" Marketplace service is high income with low risk and preservation of capital. It provides DIY investors with vital information and portfolio/asset allocation strategies to help create stable, long-term passive income with sustainable yields. We believe this service is appropriate for income-seeking investors including retirees or near-retirees. We currently provide six portfolios: two High-Income portfolios, a DGI portfolio, a conservative strategy for 401(K) accounts, a Sector-Rotation strategy, and a High-Growth portfolio. For more details or a two-week free trial, please click here or on the image below our logo above. Disclosure: I am/we are long ABT, ABBV, JNJ, PFE, NVS, NVO, CL, CLX, GIS, UL, NSRGY, PG, KHC, ADM, MO, PM, BUD, KO, PEP, D, DEA, DEO, ENB, MCD, WMT, WBA, CVS, LOW, CSCO, MSFT, INTC, T, VZ, VOD, CVX, XOM, VLO, ABB, ITW, MMM, HCP, HTA, O, OHI, VTR, NNN, STAG, WPC, MAIN, NLY, ARCC, DNP, GOF, PCI, PDI, PFF, RFI, RNP, STK, UTF, EVT, FFC, HQH, KYN, NMZ, NBB, JPS, JPC, TLT. I wrote this article myself, and it expresses my own opinions. I am not receiving compensation for it (other than from Seeking Alpha). I have no business relationship with any company whose stock is mentioned in this article.